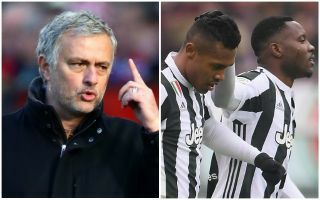 Man Utd and Chelsea look set to miss out on Alex Sandro as reports in Italy claim that he’s closing in on signing a contract renewal with Juventus. As noted by the Metro last month, both clubs were linked with the Brazilian international who was said to be valued at €60m by the Turin giants. However, despite his previous comments suggesting that he would be open to a move to the Premier League, Tuttosport now report that he’s set to sign a renewal with the reigning Serie A champions which will keep him at the club until 2023. It’s added that Sandro could potentially double his wages with his new deal, although interest from the Premier League is still noted as a threat to his future with the Bianconeri. Given the fundamental role he has played for Juve since arriving in 2015, it would be a surprise to see the Italian giants green light an exit, unless they have a replacement in mind ready to fill the void. The former Porto ace has made 132 appearances for the club over the past three-and-a-half seasons, winning three Serie A titles, three Coppa Italia trophies and he also helped them reach the Champions League final in 2017. In turn, it would come as no surprise if the two parties are eager to secure his long-term future. Nevertheless, there is perhaps also the possibility that Juve are looking to reach an agreement in order to strengthen their position with regards to a potential sale. Sandro’s current deal expires in 2020, and so by extending his stay, it puts the Bianconeri in a stronger negotiating position to demand a hefty fee. Time will tell if that’s the case or not, with Calciomercato noting that Real Madrid stalwart Marcelo has been linked with a reunion with Cristiano Ronaldo, and so could be seen as Sandro’s replacement if he were to move on.